Sri Lanka is trying its level best to include three more athletes to the already qualified three athletes for the Rio Olympics according to Sugath Tillekeratne, the President of the Sri Lanka Athletics Association, who stated in an in interview with the Sunday Times. The already qualified athletes are Anuradha Indrajit Cooray (Marathon), Geethani Rajasekera (Women’s Marathon) and Sumeda Ranasinghe (Javelin). According to Tillekeratne he has high hopes on Manjula Kumara Wijesekera (High Jump), Nadeeka Lakmali (Javelin) and Numali Liyanarachchi (800 m). Manjula Kumara Wijesekera and Nadeeka Lakmali has taken part in Olympics earlier. Manjula Kumara Wijesekera represented Sri Lanka at the Athens Olympics (2004) and Nadeeka Lakmali took part in the 2008 Beijing Olympics. “Sri Lankan athletes still has the chance of qualifying for the Rio event. With this in view Sri Lanka is hoping to stage a one day Grand Prix between May 31 and June 10. No foreign athletes will take part, only local athletes. For every event in the local Grand Prix, 12 top athletes will take part and four others – making a total of 12. This will be the first time that the Sri Lanka Athletics Association is staging such an event. “The reason for staging the Sri Lanka Grand Prix is that the Asian Grand Prix, which is held every year, will not be held this year. The local Grand Prix is bound to give our athletes the much needed experience in order to take part in the Rio Olympics. “The duration of the meet is roughly three hours and the estimated cost is around Rs. 2.5 Million. We are in talks with sponsors to raise this amount. “The Rio Olympics closing date is July 15. Before that the National Athletics Championship will be held on July 8, 9 and 10 at the Mahinda Rajapaksa Sports Complex, Diyagama. “Athletes amounting to 75, those who were in the South Asian Games (SAG) pool, including SAG medal winners will take part. This will be the final opportunity to take part in the Rio Olympics. “Also a new national pool will be formed on the performances of these athletes. The main target will be the Asian Senior Athletic Championships in Ranchi, India in 2017. The Sri Lanka team will be picked from this pool and it will be the first trial to pick the team to Ranchi. “Today (Sunday, May 15) the Junior Athletics Championships will draw to a close at Diyagama. Athletes for two international events to be held this year will be picked from this meet. The first will be the June 2 to 6, the Vietnam Asian Junior Athletics championships, where eight athletes and two officials will have the chance to take part. Depending on the performances we are trying to send a contingent of 18 to 22 for the event, including the 4X100 and 4X400 relay events for men and in the women’s the 4 X 400m event. “The team which is to be picked today will be sent on a ten day coaching stint to Malaysia and will proceed to Vietnam after that. “We are hoping that athletes will qualify for the IAAF World Junior Athletics Championships to be held in Poland from July 19 to 24. Even if our athletes fail to qualify we are hoping to send two athletes on the Wild Card. “The biggest problem facing athletics at the moment is not having good training and competition. The Sugathadasa Stadium is closed down and the standard of the Diyagama Stadium is not up to date. It is difficult to gauge our standards at this rate. “We have informed the Sports Minister about this and has requested him to upgrade one of them at least. “There is also a vacancy for a national coach. 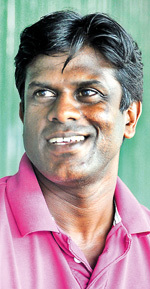 Our national coach Derwin Perera quit after the SAG quoting a low salary. Appointing a new coach is not our task. That is a job for the Sports Ministry. “Our main target is to do well at the 2017 Asian Championships, come what may,” concluded Tillekeratne. Young Footballers’ future at stake!